We all know octopuses are clever, but a recent study reveals that the brainy beasts are crafty even at the molecular level. In a study published in the latest issue of Science, researchers reveal that octopuses living in the hypothermic climes of Antarctica rely not on their DNA, but the revision of their RNA, to withstand the cold. Low temperatures impede the function of important proteins in the nervous system called potassium ion channels; if conditions get too cold, potassium channels — and, by extension, the nervous system — get sluggish. How do organisms — like the Antarctic octopod pictured up top — circumvent the issue of temperature-sensitive potassium channels? Simple: they synthesize new ones that are optimized for operating in the freezing cold. Because the instructions for proteins are encoded in the genes that make up DNA, molecular neurophysiologists Joshua Rosenthal and Sandra Garrett reasoned that the adaptations responsible for a cold-weather protein channel would reside there, at the level of the gene. But they were mistaken. When Rosenthal and Garrett compared the Antarctic octopod's potassium channel gene with that of an octopus from warm, tropical waters, they found that their sequences were almost identical. Of course, at the genetic level, the difference between identical and almost identical can mean everything in the world; a single-letter change in your genetic code, after all, can have lethal repercussions — couldn't even a small genetic difference give rise to a channel more capable of functioning at colder temperatures? Probably. But such is not the case with Antarctic octopuses. When Rosenthall and Garrett inserted the cephalopods' nearly identical potassium channel genes into frog egg cells, they discovered that the proteins produced by said egg cells functioned almost identically — even at cold temperatures. "Either the Antarctic octopus barely compensates for the cold," concluded the researchers, "or post-transcriptional mechanisms are important." What are posttranscriptional mechanisms? A gene in your DNA does not become a fully-functional protein in a single step; in the simplest terms, the process involves at least two. The first is called "transcription," whereby the genetic information in your double-stranded DNA is copied to a new, single-stranded template in the form of a messenger RNA (mRNA) molecule. In the second step, known as "translation," it is mRNA (not DNA) that is used as the final blueprint for producing proteins. When Rosenthall and Garrett talk about post-transcriptional mechanisms, they're talking about modifications taking place between the steps of transcription and translation. And this time, their hypothesis was spot on. 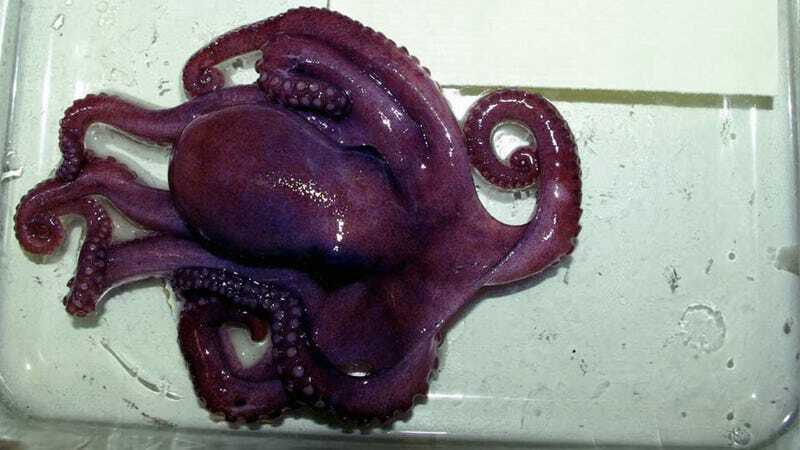 The researchers showed that through a posttranscriptional process known as RNA editing, the Antarctic octopus actually modifies its RNA at nine sites. When Rosenthall and Garrett looked at the function of the RNA-edited channel, they found it to function significantly better at cold temperatures than the non-RNA-edited protein. Remember: these potassium channels were cut from identical genetic cloth, but in the process of becoming proteins were transformed into two functionally distinct molecular machines. That's a pretty incredible adaptation mechanism if you think about it — and adds one more item to the growing list of reasons that these leggy cephalopods are deserving of our admiration. Rosenthall and Garrett's findings are published in the latest issue of Science.